What a lovely drink to look at! The picture doesn’t do the contrasting colors justice. The North Carolina Sour is a pretty one with its bottom half orange from the combination of Carriage House apple brandy and lemon and the top half full of McRitchie Ring of Fire red wine. 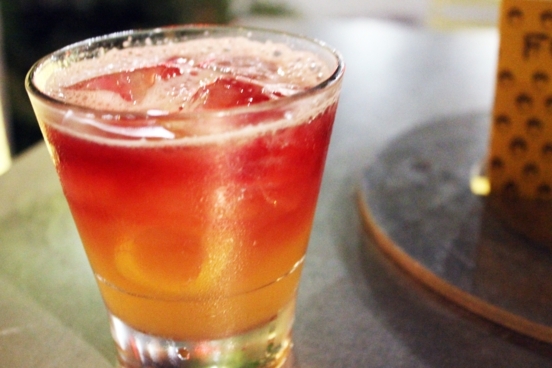 Simple syrup is the final ingredient in this citrusy drink. Make that a tad too citrusy. The lemon juice dominated, and it actually made the drink taste somewhat like a hot black tea in combination with the wine, a red blend that the makers describe as black cherry, chocolate, and toffee. I enjoyed the apple brandy flavor, but overall, the drink was flat in terms of vibrancy. It’s a good cocktail, but Foundation usually hits it out of the park.